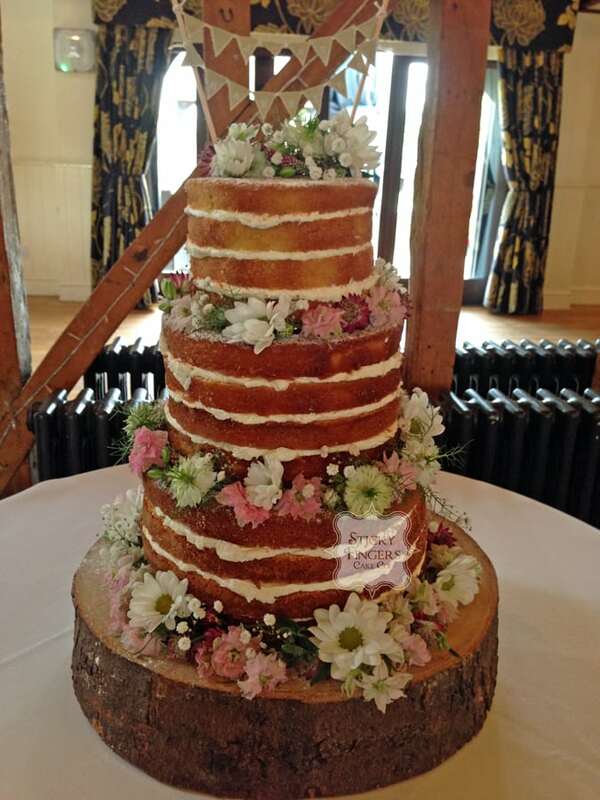 I was able to get floral when we delivered this 3 tier naked wedding cake to Channels in Chelmsford on Friday 21st August as Jenna and Liam wanted a fresh flower decoration using the same flowers as they had in the barn and I have to say the cake and all the decorations looked absolutely stunning! They had obviously worked hard sourcing the right accessories from all the tree trunk stands to the hessian runners. The flavours they chose were Madagascan Vanilla, White Chocolate and Passion Fruit and Lovely Lemony Lemon Cake. Jenna wanted the sponges to have a similar colouring but loved Red Velvet Cake so I also made one for the kitchen to cut into slices and serve with the rest of the cakes. Huge Congratulations to you both and I hope you enjoyed your West Coast American road trip honeymoon, very cool!